Dracenas are among the easiest and most common indoor plants around. Young plants are small and bushy, making them perfect residents of desks and tabletops. Older dracaenas develop woody stems and can become tree like. They're ideal for adding a bold splash of texture to your indoor decor. 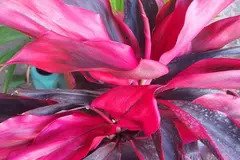 Add interest by selecting varieties variegated with contrasting colors. 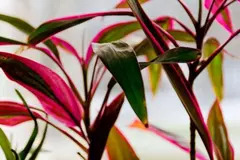 Striped-type dracaena offers beautiful leaves that look good by themselves or in combination with other plants. When they're young, they form low mounds that look a bit like stars; as they grow, they pick up some height, eventually becoming tree-like. 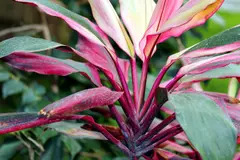 Care Instructions Grow most dracaenas in regular household conditions; they tolerate low light, but thrive in medium and bright spots, too. Water dracaenas when the soil surface gets dry; that's often about once a week or so, but can vary depending on the size of your plant, the size of its pot, the amount of light it gets, and other factors. Most dracaenas really don't require much fertilizer --- only once or twice a year to keep them healthy. But if you want more growth, you can fertilize more frequently. If your dracaena gets too tall and lanky, you can prune the top off. Most types will resprout and become bushier. If your dracaena has brown leaf tips, try boosting the humidity --- dry air (or soil that stays dry too long) can cause the leaves to develop this problem.